How are dairy cows milked? Cows come into the clean milking parlor 2-3 times a day to be milked. 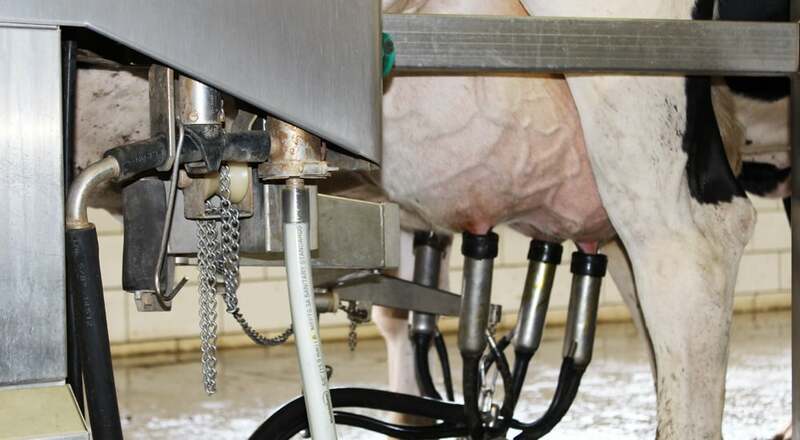 Milking parlors can come in different configurations, but the most common types in Ohio and West Virginia are the herringbone, parallel or rotary parlor. Robotic parlors are also becoming more popular. The cows enter the parlor as a group and file into individual stalls that are equipped with a milking unit and designed to keep the cows stress-free and comfortably in place. Once the cows are all in place, the cows’ teats are thoroughly cleaned. Once the milking machine is attached, the milk will start to flow through the milk machine into sanitized stainless steel pipes. After the cow is finished milking, the teats are covered with another sanitizer to protect and condition the teats before leaving the parlor. Does it hurt a cow to be milked? Today’s parlors utilize the latest technology for safety, comfort and productivity for both the cow and the person milking. Dairy cows go to the milking parlor to be milked at least twice a day by an automatic machine that gently and safely removes just the right amount of milk. It doesn’t hurt at all, and the cows really look forward to being milked.